What is endodontic surgery and why would I need it? When one option is endodontic surgery, the only other option is oral surgery to extract the tooth in question. 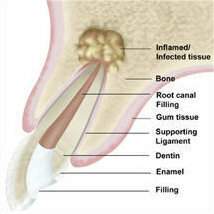 Endodontic surgery is one of the last steps to try to save your tooth in a variety of situations. Surgery may be used in diagnosis to allow us to examine the root of the tooth to try to find what is causing the pain and, hopefully, provide the necessary treatment. Sometimes there are symptoms but no evidence of those symptoms appears on an x-ray or by examining the tooth in your mouth. Sometimes calcium deposits make a canal too narrow to treat the tooth with conventional procedures used in non-surgical root canal treatment to reach the end of the root. If your tooth has this "calcification," surgery maybe needed to clean and seal the remainder of the canal from the tip of the root. A tooth that has undergone a root canal can usually last the rest of your life without needing further endodontic treatment. However, in a few cases, a tooth may fail to heal. The tooth may become painful or diseased months or even years after successful treatment. If this is the case, surgery may help save your tooth. Although there are many surgical procedures that can be performed to save a tooth, the most common is called an apicoectomy. When inflammation or infection persists in the bone area around the end of your tooth after a root canal procedure, an apicoectomy may be needed. Other endodontic surgeries include dividing a tooth in half, repairing an injured root, removing one or more roots as well as performing a root canal on a newly extracted tooth and then placing the tooth back in its socket. All of these procedures are designed to try to save the tooth. There are no guarantees with any surgical procedure but if surgery is recommended then we feel that the risk is worth the benefit. Our goal is to provide you with information so that you can make an informed decision that is best for your long term health. Often, the only alternative to surgery is extraction of the tooth. The extracted tooth must then be replaced with an implant, bridge, or removable partial denture to restore chewing function and to prevent adjacent teeth from shifting. Because these alternatives require surgery or dental procedures on adjacent teeth, which might not otherwise require treatment, endodontic surgery is usually the most cost-effective and conservative option for maintaining your oral health. In this procedure, an opening is made on the gum tissue near the tooth to see the underlying bone and to remove any inflamed or infected tissue. The very tip of the root is also removed. 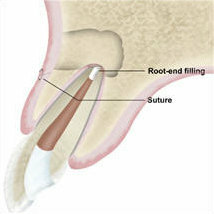 A small filling is usually placed to seal the tip of the root so nothing enters into the canal from inside the body, and a few stitches or sutures are placed in the gum to help the tissue heal properly. 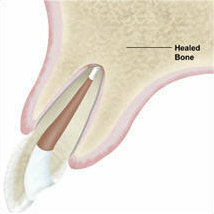 Over a period of months, the bone heals around the end of the root.